When I got back home again around 2pm Hanno wasn't feeling well. So I got him cosied up on the sofa watching pre-recorded television and later we had leftovers for dinner in front of the TV. I started a new knitting project, so I was quite contend sitting there clicking away. Yesterday was spent doing a bit of writing - an author's bio for the book and a few odds and ends, then the rest of the day was knitting and talking to the family on the phone. Kerry, Sunny and Jamie are visiting us on Wednesday. We'll all be going out for lunch, then HANNO AND I WILL LOOK AFTER JAMIE while Kerry and Sunny have some time together at dinner and the movies. :- ) They will all here stay overnight. I wish Wednesday would hurry up and arrive. I've been knitting away quite happily with the Ecoyarns that Vivian bartered with me. My absolute favourite is this organic cotton which is so soft and cuddly, and the colours are just beautiful. I rolled a natural and a deep pink skein into balls the other day and started knitting a cowl scarf that I'll probably put into my shop. I like the cowl scarves to wear to work. I hate having a cold neck in winter so one of these scarves is a better option at work because it doesn't hang down and get tangled in whatever I'm doing. I'm really pleased with the way it's knitting up and I just know how wonderful it will be. So I've said I'll "probably" put it in the shop because I might keep it myself. Knitting is a wonderful way to relax - it's like a meditation. 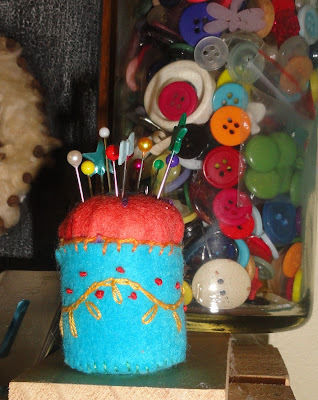 That repetitive action of the needles and yarn, twirling, looping and methodically slipping the needles through; it quietens the mind and brings a gentle kind of peace to me. I definitely needed to relax after last week's busyness, this was the perfect way to do it. I hope you are all looking after your own physical and mental health by taking time to relax whenever you can. It's important. Modern life can be stressful and you need to have several simple and easy ways to unwind and relax. A little while ago, I bought this gorgeous book with the points many of you give me by buying your books through my Amazon store. Thank you for doing that; I can usually buy one book every month. I have sworn off buying books and this is a way I still have access to books I want to read and give as gifts. This book is called "Little Luxury Knits" by Alison Crowther-Smith and it has many beautiful knitting projects in it. I've not yet decided whether I will keep it myself or if I will use it as a prize. I really like these three patterns - the fingerless mittens, the bed socks and the shawl - they're all gorgeous and all within the capabilities of a newish knitter. These kinds of books inspire new knitters and make many of us passionate about this craft. There is nothing quite like taking some beautiful balls of wool or cotton, and by clicking and sliding your needless, and winding, looping and relaxing, there you have it - something unique and wonderful, and hand made. Look at these two above and below - bed socks and a shawl. They're simple and beautiful. If you're just taking up the needles now, or are just thinking you might be interested, I encourage you to dive right into knitting. It's a soothing and all-embracing craft that not only makes you feel good, with the addition of time and effort, it will give you beautiful garments and items for your home. I urge you to use good quality yarns and needles. If you can afford it, spending that bit extra on materials you really love and enjoy working with will add to the rich experience of knitting and pay off in a better product that will last many years. I have recently discovered Clover bamboo needles from Japan and even with these soft organic yarns I'm using now, they never snag and glide effortlessly over and under whatever yarn I'm using. They cost ten dollars but I know I'll be knitting with them for many years to come. That is wise economy. What are you knitting now? If you care to share your current knitting project with me, I'd love to see it. Just leave a link and I'll pop over to visit, and I'm guessing many others will too. I hope you all make the most of the week ahead. I'll have another busy one here but I'm looking forward to what it brings and the memories I'll be able to store away at the end of it. Thank you for visiting me here and thank you so much for the comments you leave. I do not have enough time to answer all your comments, or emails, but I do read every one of them and many of them make me smile. I know that I am fortunate to have you here with me and with each comment I discover a little bit more about you. I like that! 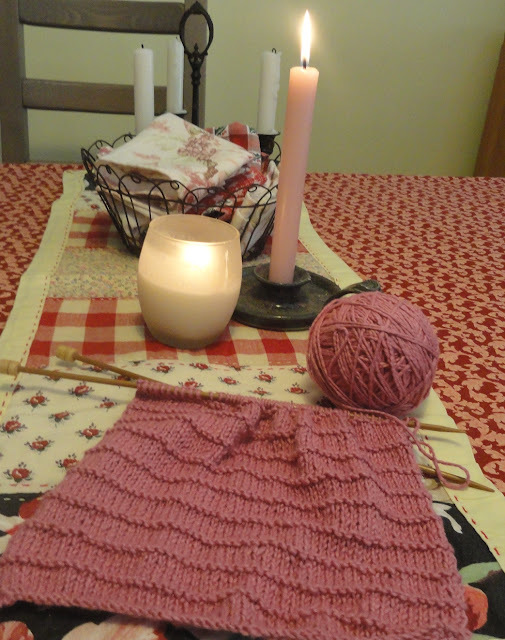 This is my (made up) pattern for the pink cowl scarf: cast on 50 stiches, then knit one row on plain (knit) and one row of purl, which is ordinary stocking stitch. Do four rows of stocking stitch, then two rows of knit - that will give you that little ridge line. Then repeat until the scarf is long enough to wind around your neck + a bit of hang. Cast off, neatly sew the two edges together and bind in any threads. If you want to be a bit fancier, make the scarf slightly longer and twist it once before you sew the ends together. You will end up with something like these. This morning I'm still thinking about yesterday - Sorry Day in Australia. I attended a very moving event and was fortunate enough to listen to the stories shared by some remarkable indigenous people. Sorry Day is not about saying sorry. Of course it's implied that we are sorry for what these people and their families went through, but this is a day of reconciliation and coming together. It's about being quiet for a change and listening to the experiences of others, it's about being part of a solution instead of seeing only problems, it's about acceptance of one another and the past, and moving forward - together. There were four flags flying at the entrance of the neighbourhood centre when I arrived. 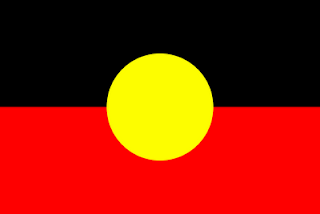 The first one - red, black and gold, is the Australian Indigenous flag, then the Torres Strait Islander flag, the Queensland flag and the Australian flag. Our neighbourhood centre sits on Kabi Kabi traditional land. Wiruungga and Kerry conducted a smoking ceremony to cleanse everyone as they entered. The early crowd drinking tea, making headbands and talking. Between 150 and 200 people attended. 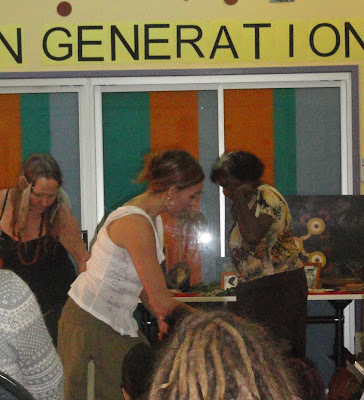 The ceremonial table holding photos of Stolen Generations people and ancestors of Aunty Pam, as well as paintings and artefacts. Some of the women singing in language. Aunty Beverly is on the end and she's totally blurred out. Sorry Bev! Terri-Ann, Bianca and Aunty Theresa (visiting from Cape York) - with their interpretation of the day, in dance. At our Sorry Day, Aunty Pam and Aunty Beverly shared the stories of their families and country then, one by one, several indigenous folk came forth, shared their stories and how they and their families had been affected by our former government's policies. These are strong people. To have survived what they did and still be here, smiling and willing to share their rich culture with us, is something close to wonderful. We are one nation and together, helped along by events like that one yesterday, we'll move towards a better deal for us all. No one is saying sorry every year, what we are doing is becoming friends, getting to know each other and developing trust; we are learning about their culture and languages - they know a lot about ours. There was a warm feeling of mutual acceptance yesterday. It's been a long time coming. This photo wasn't taken yesterday but it is of my good friend Beverly Hand and me. I am very proud of Aunty Beverly for many reasons but she was recently awarded a Senior Fellowship at the University of the Sunshine Coast, where she speaks as a guest lecturer and acts as an advisor on conservation and land management. 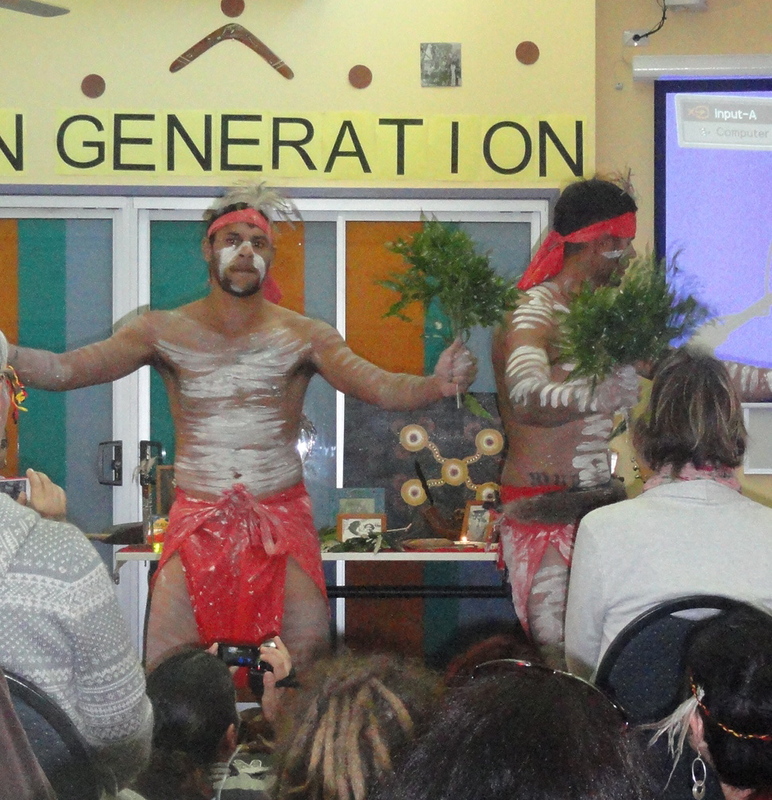 Today is Sorry Day in Australia. This day is an opportunity to show respect to our fellow indigenous Australians and to move closer towards reconciliation. The first Sorry Day was held in 1998 after a government report called Bringing Them Home recommended, among many other things, that an apology be made to the aboriginal people for forcibly removing the Stolen Generations from their parents and communities. Many of these people never saw their parents again. I'm ashamed to tell you that it was Australian government policy to remove these children up until 1969. The recommended apology eventually happened in 2008; the first major official act of a new Prime Minister, Kevin Rudd. The Apology Day ceremony was held in Parliament House and brought together many black and white Australians from cities, towns and the outback. They were met at the front door by the Prime Minister, who greeted many of them with: "Hello I'm Kevin." When I saw that, I felt very proud to be an Australian. However, today, on this Sorry Day 2011, many Australians would not know we are commemorating this day, and the vast majority will not attend any reconciliation or sorry ceremony. The Maleny Neighbourhood Centre's Sorry Day will start at 10.00am. There is a timeline, speeches, music and food to share. Aunty Beverly and Aunty Pam will be there to meet and greet. As far as I know there is no other event on the Sunshine Coast and I couldn't find any listed in Brisbane either. If you wish to come to ours, please join us. Everyone is welcome. I haven't written about Alice lately. She's still with us but her eyesight is very poor and she's deaf. She's also lost all the hair on her bottom and back legs. We are currently looking after another Airedale, Koda, Jens and Cathy's dog. Koda is a very big girl but she's gentle and timid so it's good to have her here with Alice and it's lovely seeing them play together. I feed them early in the morning when I get up and leave them outside to do a wee then they come inside again. The signal they want to come in is when Alice gives one bark. Yesterday when I hear the bark, I went out and opened the door and only Koda walked in. Then Alice barked again. I looked out into the darkness and could barely see Alice on the verandah. She barked again. I walked over to her and she was standing facing the washing basket trolley - she thought it was the back door. :- ( We cherish every day we have her with us. I have finished making the prizes for a competition we're having at the Down to Earth Forum which ends next Tuesday. The competition is for the best post in May. It can be on any subject, by any of the members or moderators. I will pick the winner. The prize, when only the best will do, is a handmade pure cotton apron, two pure cotton waffle weave dishcloths and two balls of pure Merino organic Australian wool. I will post the prize anywhere in the world, so get your posts in now. 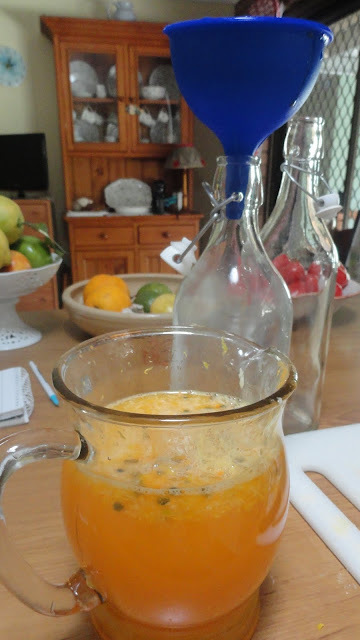 And finally, for those who are following along with the vinegar making, here is my vinegar, photo taken now as I write this post. Looking into the side of the jar there is not much happening but when I took off the lid, I could see bubbles starting on the top. That's a good sign. It's also a good sign if you see movement in the bottom sediment layer. Fermenting is a live process, this movement is the fermentation process happening right before your eyes. I have been struggling with my vinegar because it's been quite cold here. I've been taking it outside, with the jar wrapped in a towel, and the top open, to sit in the sun on the verandah. When I cook, I sit it close to the stove. Hopefully, all that attention will pay off. How is yours going? I am an early bird. I love working in the morning. I write my blog as soon as I get up because I can then get on with the things that will be done during the course of the day. This life we live is labour-intensive, and now that I'm older, I have much more strength in the morning; it makes sense to do all my heavy tasks before lunch and to leave the mundane or lighter things till the afternoon. Things feel different in the afternoon. I always feel like I'm getting reading for something, or that we're winding down. But in the morning, there is possibility, hope and promise. Anything could happen, there is a full day unfolding ready to be filled by whatever we choose to lay on its pages. I usually lay laundry, baking, washing up and cooking on its pages, to me, at this season of my life, that story makes the best reading. I have been thinking a lot lately about why I feel happier and more focused in the morning. I'm guessing that every morning holds the promise of time. Time to bake or knit or clean or sit and think. It's that promise that's the key. I tend to focus more of the positives of life and ignore the negatives - another wonderful byproduct of ageing. That is not to say the negatives don't happen around here. Just like everywhere else, we have our share of boring chores, bad days, irritating phone calls, conflicting appointments, and arguments. But when I get up every morning, I rarely think about those things, mornings are for planning and doing the good things, for brilliant ideas, getting on with the interesting tasks and knowing, that because it's still morning, there is still time today to do everything I need to do. And even if it goes pear-shaped during the afternoon, everything will look better in the morning. If you already know of Eilleen's blog you'll know that she often challenges herself, but if you don't know the Consumption Rebellion blog, I encourage you to go there and read what Eilleen's been up to. It's very inspiring. Eilleen is also one of the writer's on my "other blog" the Simple, Green Frugal Co-op. I've had a few emails recently asking for recipes for quick meals. I made this impossible quiche a few days ago. The prep time took five minutes, I put it in the oven for 40 - 50 minutes and it was on the table. This quiche makes its own 'pastry' so even if you think you don't make good pastry, or have never attempted pastry, this will work well for you. This is an excellent mid week-meal and even if you have a husband or teenagers who must eat meat at every meal, the bacon in this quiche and the promise of home made apple cake for dessert, maybe with some piping hot custard or ice cream, might persuade them it's not so bad after all. If you have more time in the morning than in the evening, make this in the morning - even half cooking it would be fine, put it in the fridge for the day and finish off or warm it up just before you eat it. Place the following in a frying pan and cook, then put it to one side. Add the fried vegetables to the egg mix and pour it into a greased ceramic quiche dish or shallow pie dish. Cook in the oven on 190C/375F until golden brown and set in the middle. MY VINAIGRETTE - I much prefer a vinegar-heavy dressing on my salads. Put it all in a jar and shake till it has combined. And for dessert? Why not try a serving of apple pulp cake. I had a lot of pulp left when I juiced apples last week. This took care of one of the bags of apple pulp. NOTE: if you have no apples, tinned peaches or apricots - well drained and mashed with a fork, would be a great alternative. Cream together the butter and sugar until light and creamy, add the eggs and work it in. When fully incorporated, add the flour, apples, salt and vanilla. Fold in and add enough milk or buttermilk to make a thickish dough. 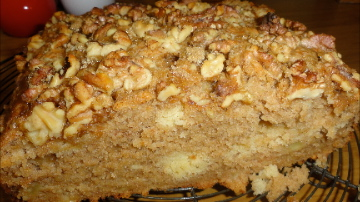 Add to a cake tin and sprinkle over half cup of crushed walnuts and one tablespoon brown sugar. Bake on 190C/375F until golden brown. If you're following along with the vinegar making, don't forget to find a warm place to keep your vinegar. The bacteria and yeasts need warmth to grow. A warm and sincere thank you to everyone who visited Sarndra yesterday. We are both delighted with your lovely and encouraging comments. I have no doubt Sarndra will have many excellent organising ideas in the future and I'm looking forward to seeing how she leads us towards better organised homes. I have been reading the wonderful Wild Fermentation book by Sandor Ellix Katz, with foreword by Sally Fallon of Nourishing Traditions fame. If you have a chance to read this from the library, or better still buy it - it will make an excellent reference and recipe book - do so. It is a sensible and intelligent guide that will lead you on healthy food pathways. This post comes partly from reading Wild Fermentation and The Vinegar Book by Emily Thacker, partly from making vinegar the past couple of years and partly knowing that without fermentation there will be only lifeless food. You can read my old post on pineapple vinegar here. I love good vinegar. Hang on, I like the cheap cleaning vinegar too. I guess I love all vinegars. I love that sharp acid taste, it's health properties and being able to clean with it is just the icing on the cake. Vinegar is really easy to make and anyone can do it. Can I entice you to give it a go? You have to get rid of all those notions of having sterile food because vinegar, along with cheese, sourdough, yoghurt, wine, beer and many other foods and drinks, rely on bacteria and yeasts to give the flavour. But remember, you have control over every part of this process. I reckon if you saw behind the scenes of many food making factories you wouldn't touch their food. If you try this, it will show you a natural process that has been used for hundreds and probably thousands of years, that will deliver a wonderful product to you. This is gourmet food making at its best. 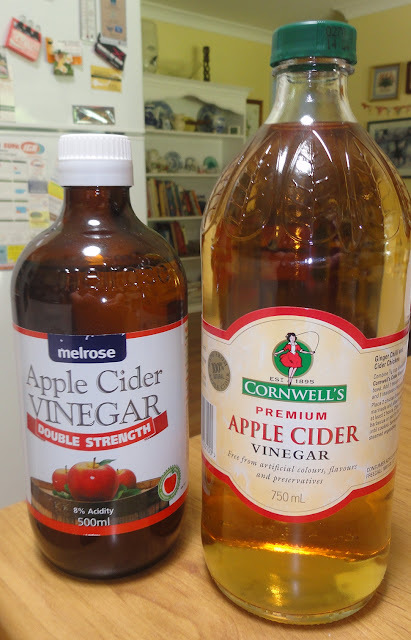 You can make excellent vinegar at home using old wine, apple cider or fruit. It requires no special equipment. Today we'll be focusing on apple vinegar, because I still have an over-abundance of apples, but you could make this with any fruit or fresh fruit juice you have on hand. 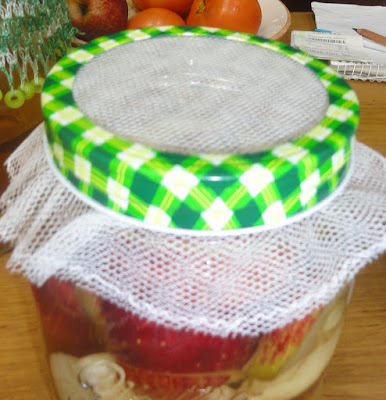 You will need a glass or crockery wide mouthed container that will hold about one litre/quart, and a net, cheesecloth or muslin cloth covering to keep out the visiting vinegar flies and other insects. If you want to make a large amount of vinegar, use either a water crock or a food-grade plastic bucket. 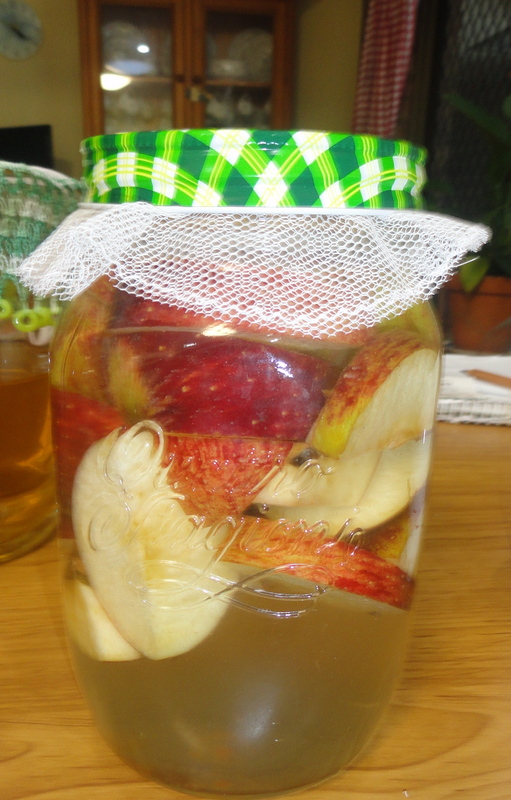 Air is very important to vinegar making - it is an aerobic process. Your vinegar must have air contact all the time to allow the airborne beneficial yeasts and bacteria in your home to colonise the liquid. Stirring the vinegar during the making of it will increase the amount of air being introduced to the mix and will increase your chances of making good vinegar. It also needs to be stored in the dark, so keep it in a dark cupboard during this process. If your first attempts at vinegar making fail and you've been using glass, you can give it another go using a container that doesn't let in any light. If you routinely use anti-bacterial wipes or soap, you may have knocked out all the good guys. According to Mr Katz in Wild Fermentation, "Your skin, your orifices, and the surfaces of your home are all covered with micro-organisms that help protect you (and themselves) from potentially harmful organisms that you both encounter. Constantly assaulting the bacteria on, in, and around you with antibacterial compounds weakens one line of defence your body uses against disease organisms. Microorganisms not only protect us by competing with potentially dangerous organisms, they teach our immune system how to function." (Page 9) I agree with him wholeheartedly. If you don't have access to rainwater, the day before you make your vinegar, save a litre of tap water and allow it to sit un-covered to let the chlorine evaporite off. You don't want to introduce anything into this process that will inhibit the growth of the yeasts you are hoping to capture. Some tap water is heavily dosed with chlorine which kills bacteria and like antibacterial wipes, it kills the bad as well as the good yeast and bacteria. If you use it, you may well kill off any hope of making your own vinegar because the water will kill the colonising yeasts and bacteria. I was going to add some leftover Scrumpy cider to my vinegar but I checked the label before adding it, saw that it contained sulphides, and left it out. Sulphides are added to some food and drink to stop bacterial contamination, it would have killed off the beneficial yeasts and any chance I had of making vinegar. Had I known this Scrumpy contained sulphides, I wouldn't have shared the bottle with Hanno for dinner last night. Start with a clean jar - wash it just before you use it - warm soapy water and a good rinse. Add ¼ cup of sugar and a litre/quart of filtered or distilled water to your jar, then add any cut up fruit or fruit scraps you have - apples, bananas, grapes, mango, pineapple - whatever and fill the jar. Then pour enough water in to cover the fruit. Cover the jar with an open weave cover, fix the cover down and leave it in a warm place (around 23 - 28C/73 - 82F) to ferment. And that's it. Stir the mixture at least once a day and recover it. I have a number of vintage and new coverings for the wide variety of fermented foods I make here, if you don't have something similar, here is an easy way to make one. Take a piece of open weave cotton or a double layer of net and cut it to the size you need, with about two inches overhang. Zig zag around the outside with your sewing machine, or hand stitch it. Now cover the top of your container and fix it on with either a rubber band or one of those canning lids without the centre piece. See the photos below. If you're a keen crocheter, you could copy this style of cover which were in most kitchens up until the time we stopped making all those delicious foods like sourdoughs, sauerkraut, ginger beer and vinegar. I'll be following this vinegar along over the weeks, so if you decide to join in, we'll troubleshoot along the way if there are problems. If you've ever longed for the days before cheese slices and sterile food, now is your chance to win back forgotten techniques that will allow you to make food the way your great grannies did. Our first vinegar checkup day will be this Thursday. Today I'll be in my work room, sewing. Yesterday I put away these trims and pieces of wool felt I bought when I was visiting down south, today I'll be making aprons and table runners. I've been thinking about this for a while because I want to create stock for my little blog shop. One of the aprons I make today will be a prize at the forum, the rest for the shop. I wonder what you'll be doing. I was out at my voluntary job yesterday, I finished the solar grant I was working on and started writing notes for some workshops that will happen soon. It was freezing up there in the mountains, so I'm looking forward to being at home all day today catching up on my work and writing a few bits and pieces. I have to make soap so I hope to get that done today, and the floor needs washing, clothes need to be put away and yarns sorted out. I still have to organise some trims I bought while I was at Tricia's and I'm trying to knit up a few dishcloths to put in my shop (coming soon), but it's slow going at the moment. I'm sure you're all familiar with these very ordinary tasks, they may be slightly different in your home, but their all similar; this work is universal. My reward at the end of the day will be to sit and read some new books I received lately. Wild Fermentation and Little Luxury Knits. They are books I could buy through Amazon because of the points I received through your purchases. So to every one of you who has bought books through my blog, I appreciate it very much and thank you sincerely. And speaking of reading, I have made what I consider to be a huge change in my reading materials. Those who have been reading here for a long time will probably remember that I stopped buying magazines many years ago and the one I regretted not buying and stilled missed very much was British Country Living. Well, while I was at Tricia's, she bought the latest edition and I was delighted to be able to read it again. I told her I didn't buy it any more and she asked me why and added: "I thought you still did all those small things that give you pleasure." I felt like I'd been hit on the head with a mallet. Why had I made myself miserable not buying this magazine? Every time I saw it at the newsagent's, I wanted to pick it up and look through it but never did because I thought I would weaken my resolve not to buy it. Then I would walk out of the shop feeling miserable. Well, I can afford to buy that magazine with my pocket money, the magazine was a small pleasure that I really looked forward to and cherished and I have decided to buy it again! I bought the first one last week. I will finished reading that too today. Small rewards at the end of the day. Whatever they are, they're always a treasure. What are your small rewards? When I was working, and particularly when I was in my 40s and early 50s, I was very ambitious. I wanted to be happy, successful and have a thriving business. I ran my own company, producing a town newspaper for one of our big mining companies, was well as reports and training manuals. I loved taking control of this little business, producing products that people needed and knowing that I was making a success of something that I wasn't supposed to know much about - writing about mining. Times have changed now, but back then women were supposed to be in the office, not writing about how to operate dump trucks, underground workshops and control rooms. I got to a stage though when I couldn't continue in that field. I stopped enjoying the trips to the mines, I didn't like working in a mostly male environment and I hated the travel. I retired early and wondered what I could possibly do that would replace the feeling of strength and satisfaction I once felt working for myself. Enter homemaking and being a stay at home wife. Soon after I made my change I tried to make sense of housework. I had never enjoyed it and felt it was an annoyance that interrupted me going out and enjoying myself. But when I came home to stay and realised that I probably wouldn't work for a living anymore, I knew deep down I had to somehow find at least some satisfaction in my work at home. Little did I know the mother lode of happiness was waiting to be unearthed. In the beginning, I wondered how on earth I would be able to fill the day, and not just one day but every day that was to come. I was reading all the time, thinking about how I wanted to live and one thing was clear, I didn't want to work again. So, if I knew that, the oppositie was also true, I would be spending a lot of time in my home. I started a few experiments in cleaning and rearranging things and it didn't feel that bad at all. I was lucky in that I enjoyed my own company so I went from there to wondering if I would get to a point of enjoying being at home. I'd always loved cooking so I started cooking, then I baked bread and tried to perfect my plain ordinary lunch time loaf. That worked! I made very good bread. I started making the bed every morning, worked on making some natural cleaners, then soap, and before I knew it, I was happily occupied all day. After a couple of months at home I got to the stage of going to bed happy, content with what I'd achieved and making plans for the following day. I was thankful for each new day and the opportunity to discover new ways of doing my work. New thoughts were beginning to emerge and I was smiling a lot more. We have always lived with elements of simple life - we had been keeping chickens and gardening for many years, so I decided to expand on that. 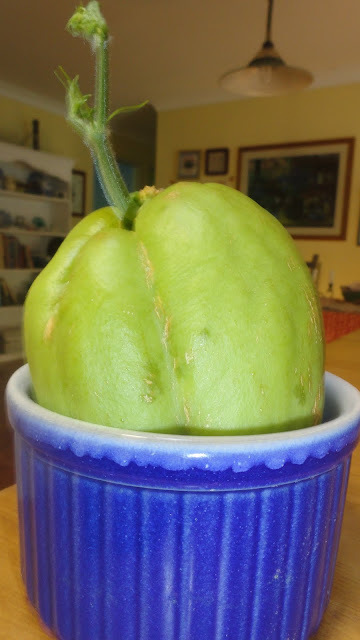 I started planting more vegetables, then tried to grow everything we would usually buy. That lead to more new recipes, a homemakers journal to keep all the information in and gently, from one day to the next, real change started happening. 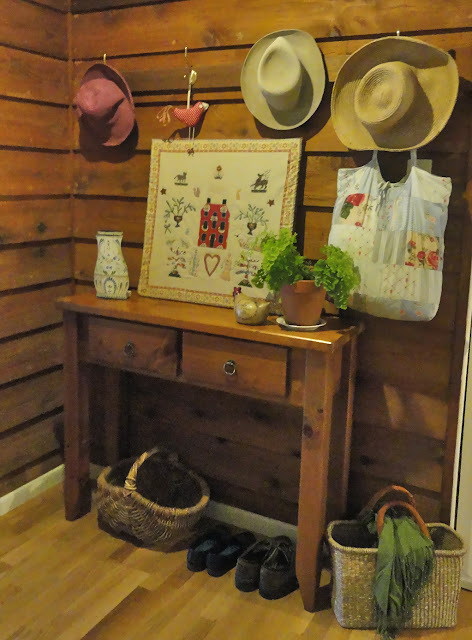 I came to realise that homemaking is very much like running your own business, and just like a small business, you get out of it what you put in. I had to work to a budget, there were performance indicators to guide me and the amount of work I did reflected on the entire enterprise - I could make it or break it. My business meetings were replaced by family gatherings, making a presentation in front of a group became cooking a meal for a celebration and while I was not paid by cheque or direct debit, I was certainly paid in love and appreciation from others, and that wonderful feeling of satisfaction. When I looked back on my short history at home, I was amazed that I was happy and interested in what would happen every day. But the thing that surprised me the most was the feeling of strength, enrichment and fulfilment homemaking gave me. I know now that there are many ways to be a strong woman. Running your own company and being successful is one way but you also demonstrate strength and significance as a mother, matriarch and homemaker. You are keeping your family functional, happy and focused. You are the person who makes it possible for many others to do what they do. You are the one who makes a safe, comfortable haven for the family. Your cooking nourishes, your cleaning keeps them safe, your organisation keeps them on track. Your wisdom helps lead your family. Your decisions mean something. I still think the work I do in my home is like running a small business. I have different departments, a have to stay in the black with my budget, there are quite a few people I try to keep happy; but there is also a huge point of difference. Never once in all my time working for a living, even when I had my own business, did I feel really in control and free to do whatever I wanted to do, as long as it didn't sink the ship. I feel that every day now. 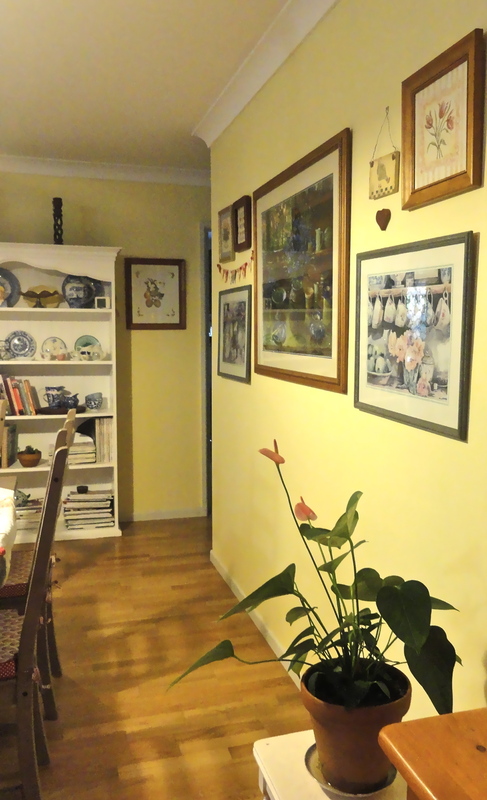 There is an extraordinary feeling of freedom working at home. There are no rules except those I make for myself, I can do whatever work I feel like doing most days and there is no one looking over my shoulder. I know many of you feel the same about your own homes, whether you work there full or part-time. I doubt I would be as happy in any other place now. If I could isolate one part of our home that facilitates our way of living the most it would be our roof. There has been a lot going on up there in the past couple of months and it's all exciting stuff. Well, it's exciting to me. :- ) I told you all about the solar panels we had installed in April, then, last Thursday, when we were out, the solar system meter box was installed. That gives us a good idea of our usage and what is going into the main grid. From what we've seen so far, I think we've paid our last power bill! Not only does that decrease our cost of living, it also lightens our footprint, and for that, I'm very thankful. The thing I haven't told you about yet is that Hanno started the huge job of roof cleaning, maintenance and painting. 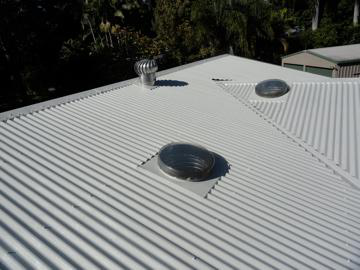 Our home was built in 1985 and the corrugated steel roof has protected us since we moved here in 1997. However, there have been leaks lately, especially on the verandah, and something needed to be done. Hanno examined the roof a couple of months ago, cleaned it with the Gerni and started checking the bolts holding the roof on. Many of them were rusty and had to be replaced (with slightly larger ones so they gripped the timber in the old hole) and all of them were treated with White Knight Rust Guard - a liquid that removes rust then primes and seals the metal. There were over 450 bolts in total. Just that was a huge job but it had to be done - we want this maintenance to keep the roof in good order for another 25 years. Hanno will be 95 then and I will be 88. If it needs further maintenance after that, we might get someone else to do it; although knowing Hanno, he'll probably want to have a go at it himself. :- ) I am really pleased that he is able and willing to do this kind of home maintenance. It has saved us thousands of dollars and it helps us live well in our little home. When all the bolts had been replaced and sealed, Hanno started painting. There are two newer sections that we built when we came to live here - the garage and a bedroom extension. Those areas were painted in Taubmans exterior gloss. Hanno said gloss is better for that purpose because it will be easier to clean in future years with the Gerni. The rest of the house was painted with a solar reflective off-white paint called Globalcoat. 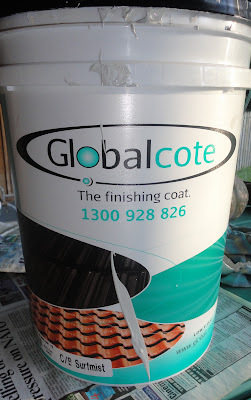 It's a specialty high gloss acrylic paint, made in Australia, for concrete, terracotta and metal roofs. It's like a rubber coating that doesn't chip or peel and is guaranteed for 10 years. He's been painting for about six weeks now, it needs two coats, and he's still going up the ladder everyday to do a bit. It's almost finished, thank goodness. Being solar reflective, the paint will increase the energy efficiency of our roof and along with the other elements up there, while keeping us sheltered from cold, rain and sun, will help us consume less electricity. Our roof is one of the reasons why a small solar unit will give us all the power we use. Along with the solar panels that give us solar electricity, we have a solar hot water unit. This has been operating perfectly since it was installed in 1998. 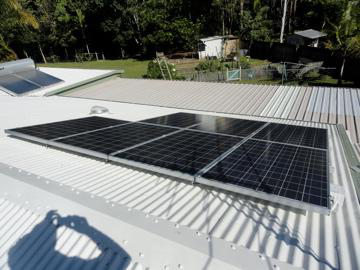 Solar hot water cuts about 30% off the average electricity bill in Australia. We also have three skylights - one in the kitchen, one in the bathroom and one in the laundry. We have no windows in that bathroom or our laundry but even on dull days we don't have to turn on the light in those rooms. The skylight in the kitchen was installed when we added our back verandah, which made the kitchen quite dark. The light is never on in the kitchen during the day, the skylight gives us excellent light at no cost to us or the environment. Also up on the roof, we have whirly birds that spin due to their design, extracting hot air in the roof. These, together with the solar reflective paint now on the roof, should make quite a difference in summer. We have a great roof and like other parts of our home, it has been modified to suit our way of living. We aim to keep it in good order so it will continue to help us live lightly on our tiny portion of the world. We have lived here for 14 years, the paint and the solar panels have been added this year, as we could afford them. 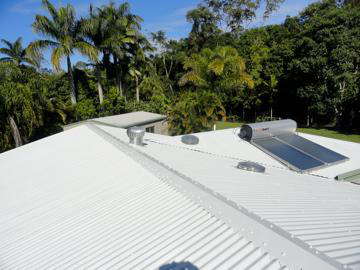 The solar hot water, whirly birds and skylights were added in exactly the same way - when we could afford them. It doesn't matter if you can't do everything you want to do in your home when you first move in. Just devise a plan, save your money, and add what you can, when you can. It might take a while, but if you're living true to your values and those values include being as self reliant and energy efficient as possible, then it doesn't matter how long it takes. Make a plan, work towards your goals, and buy when it is wise to buy. We had a wonderful visit with our family on the Gold Coast last Friday and once again I could hold my beautiful grandson, Jamie. The only downside is the trip there and back because the traffic is terrible. Still, it's worth it to see everyone, catch up on the news and see how Jamie is progressing. There is no doubt in my mind - food and drinks made at home from scratch are far superior to what you buy at the shops. Not only are they tastier, fresher and healthier, they usually cost less for a better product. I spent some of my Sunday making a few odds and ends in the kitchen. We had been given a free box of apples and I wanted to do something with them; the first night I made an apple crumble. 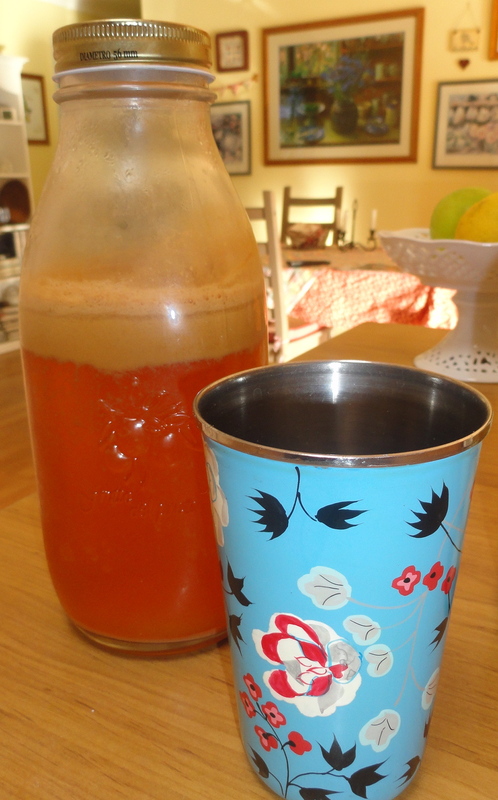 That still left over 300 apples, so I skinned and seeded a bowl full of them and made up a litre of apple juice. If it wasn't so labour intensive, I would have juiced them all but I had to de-seed the apples because there is a small amount of cyanide in the seeds, and these apples were commercial apples, waxed, so I had to peel them too. Still, the juice that resulted from that exercise was so good; Hanno and I had a chilled glass each with our roast pork for dinner. The leftover pomace has been bagged and frozen for future apple and fruit cakes. I found some pickling onions at the store on Friday so I bought a kilo. While I was at Tricia's, we went out for lunch a few times and I had one of my favourites - Ploughman's Lunch - a mixed plate of sourdough, good tasty cheese, pickled onions, gherkins, ham sliced from the leg and a relish. One of those lunches had the most delicious pickled onions I'd had in a long time. Clearly they were not a commercial brand, and had probably been made by the chef. I think they were pickled in balsamic vinegar. They inspired me to make pickled onions, hopefully as good as those I had on my ploughman's plate. I really like having a jar of pickled onions in the fridge. They last a long time and they're a wonderful addition to a lunchtime sandwich or a snack plate. This jar will sit for two months to let the vinegar and spices do their magic before we eat them. There seems to be quite an interest here in preserving, so I thought this would be an excellent starting place for those of you who haven't done any preserving before, have no equipment, but would like to give it a go. All you will need for this, apart from the ingredients, is a litre | quart sized preserving jar, with a pop-top lid, in good condition, a saucepan large enough to boil it in (completely covered) and a smaller saucepan for the vinegar. The jar I used is one of those Italian preserving jars you can commonly buy in either a supermarket or department store here. Recycled jars are fine for this job - make sure they're undamaged and the lid is perfect. Wash the jar and lid in warm soapy water and rinse it well. Let me say first that many of my American friends might be a bit concerned with these instructions. I'm not going to use a water bath or pressure canner, but these onions will be fine for about a year without that processing. It relies on high acid vinegar and sugar to keep the food safe; both of them stop micro-organisms surviving in the highly acidic, sugar liquid. 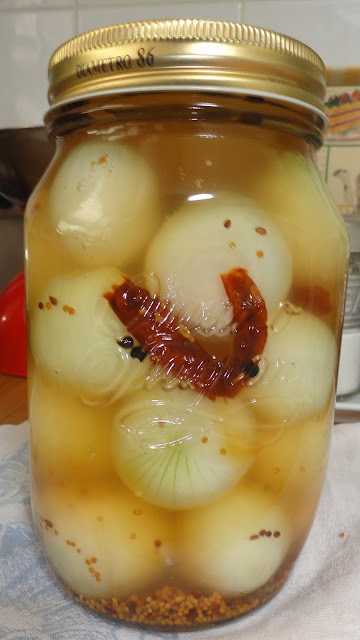 This way of preserving is common in Australia and the UK and although your method of boiling everything is how you're advised to can food, this is the common way to put up pickled onions in the Commonwealth. If you ever see this Melrose vinegar (or Braggs vinegar) in the shops, grab it. It will be more expensive than ordinary vinegar, but it contains "mother of vinegar" and with that you can make your own vinegar. Before you buy, lift all the bottles up to the light and buy the one with the most strands or blobs of stuff floating around. I know that sounds gross, but the "mother" floats around in the vinegar. The taste of the end product will depend on the quality of the ingredients you use. Do NOT use your cleaning vinegar for this. I used the excellent Melrose unpasturised apple cider vinegar and Cornwall's Apple Cider Vinegar. I didn't have enough Melrose for this recipe because I wanted to keep the "mother" in the bottom of the bottle for making new vinegar. So I added a small amount of Cornwall's vinegar to make up the volume. Vinegar used for pickling must be at least 5% acid. Melrose is 8% and although Cornwall's never state on their label what level of acidity it is, they recommend it for pickling so it must be at least 5%. If you're in Australia and you can't find all the spices in the shop, use a packet of Menora pickling spice. I bought mine at IGA. Cut the top and bottom off the onions and place them in a bowl. Cover them in boiling water and leave for about a minute. Pour off the hot water and replace it with cold water. When the onions are cool, slip the skins off the onions. Dry the bowl, place the onions back in it, and sprinkle the salt over the onions. This will draw fluid form them. Leave this, covered, for 24 hours. The next day, boil your jar and lid in a saucepan. It must be completely covered. Bring to the boil, then let it boil for 10 minutes. Turn off the heat and leave it in the hot water until you're ready to fill the jar, it must be hot when you add the hot vinegar. In a small saucepan, add the vinegar, sugar and all the spices and leaves. Bring to the boil, making sure the sugar has completely dissolved. Let it simmer for a two minutes while you prepare the jar and onions. If you want to taste the vinegar, now is the time to do it. To adjust the flavours, add more vinegar, sugar or spice. Remember that the flavours will develop a lot while it's in the jar and what might taste quite harsh now, will turn into a soft and mellow liquid in a couple of months. Wash the salt off the onions, then place the onions in a colander to drain. Now you have to take the jar from the water without burning yourself and without contaminating the inside of the jar and lid. 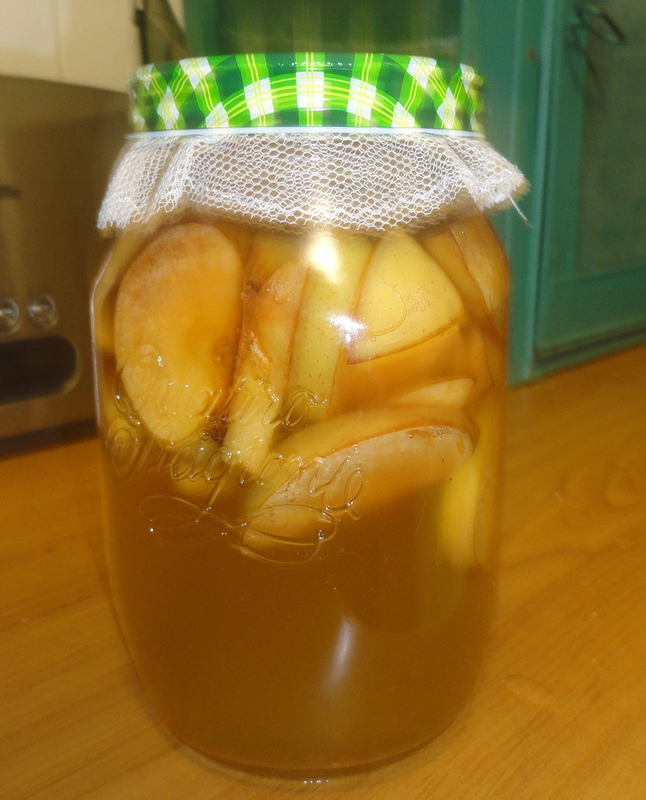 With your jar tongs, take the jar from the water and place it on the bench, making sure all the water has drained out. If you have no jar tongs, pour the water out of the saucepan, pick up the jar on the outside with a tea towel and lift it out. Don't touch the inside of the jar, it must remain sterile. Same with the lid - you can touch the outside but not the inside. Pack the onions into the jar then pour the vinegar over the onions and fill it right to the top of the jar. The vinegar will still be very hot so be careful. Put the lid on the jar straightaway. The hot contents will help form a vacuum seal. When the lid goes on, you'll notice the pop top button on the lid will be up. When the vacuum seal happens, that button will invert. That is your sign that it's sealed properly. When that happens, you can store the jar in your cupboard for up to a year. You want the vinegar mix to infuse the flavours into the onions, so let it stand for at least six weeks to mature before opening. When you open the jar, it must be stored in the fridge. If the pop top on the jar doesn't invert, the onions are still okay to eat, but you'll have to store them in the fridge and eat them within three months. Preserving food in jars, while not as popular as it once was, before so many of us got freezers in our homes, still holds relevance for those of us living this way. It's a useful skill to learn. You can put up several jars, or a whole pantry full, or you can do what I do and make small numbers of gourmet food jars that can be enjoyed for a fraction of the price you'd pay for the same quality in the shops.